Managing your schedule shouldn’t be a monstrous task! You choose which appointment types clients can book online. Let clients add themselves to your waiting list or add them yourself. Then easily book them in when openings come available. Access schedules for both you and your staff anytime, anywhere. 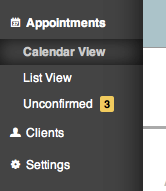 Opt for either stylist approval before finalizing bookings or allow salonMonster to automatically finalize them for you. Keep track of the color and service histories for every client and appointment.